A Shepherd's Heart: The Fine Art of Allowing God To Be Your Defender. It's not our natural inclination to be silent sometimes. This is especially true when someone is being rude, abusive in speech, wrongly accusing us, trying to malign our character, misrepresent the truth or a multitude of other things. We're all growing in grace and in those moments, we are most likely quick to try to defend ourselves, however, we have to be careful to no not rely on our emotions in those moments as often times we can make things worse by our response. We need to immediately seek the Lord and ask for His wisdom and help to know how to respond which in the moment may be difficult...however, all it takes is a real "in the moment" silent or spoken prayer that will truly help you and I! We also should remember that there were times when Jesus, even though He had all the authority and facts to do so, He didn't defend Himself when accused. He is our true example of how to respond in these times as well as the One we should seek through these times! 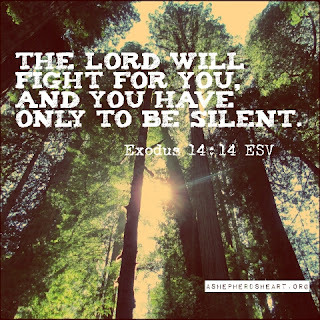 There are times when God will call us to be bold and speak...but often we confuse our self-driven nature and desire to bring our weapons out to defend ourselves, or to be "right", when sometimes God wants us to be silent so He can defends us. Ultimately, God is your defender. As you trust in, rely on and seek Him, He will give you the wisdom through His Holy Spirit to know when you should speak and when not to do so. The fine art of allowing God to be your defender starts first with knowing you desperately need His help, secondly by getting out of the way, third by seeking Him, and in turn finally actually allowing Him to be your defender! No doubt this is NOT easy which is why it's a "fine art". We like to think "we're in control", but, with God as your strength, you will grow in this area and become better at this as you mature in your walk with Him. Make Him a partner and The Leader in every battle you face! God is your defender so pause for a moment right now and thank and praise Him for Who He is! P.S. Encourage someone today that God is their defender! Amen! God is always in control! Thank you for your ministry and the love you share. Amen and thank you for your comment and encouragement! Great message. Of late God has been talking to me regarding the subject. Your message confirm what the Holy Spirit is teaching me. Thanks brother. Thank you for your encouragement. Isn't it interesting how God is at work in our lives and sometimes He's working on the very same things in others lives that He's working in ours. :-) God Bless you! You're most welcome. Thanks for your encouragement!